PRESS RELEASE: FXpansion is proud to present BFD Heavy, a BFD2 expansion pack containing a pair of immaculately recorded Yamaha birch drumkits, supplied with a set of presets perfect for heavy rock, metal and other styles that require powerful, weighty drums. The Recording Custom is the kit that signalled Yamaha's arrival as one of the dominant forces in the world of drumming. This all-time classic birch kit comprises 2 powerful kicks, played with felt and wood beaters, alongside 4 toms featuring superb attack and sustain, and played with sticks. The Birch Custom Absolute, meanwhile, is the culmination of Yamaha's 25 years of experience in crafting birch shells. Offering a great alternative to maple, birch shells feature excellent mid and low end, with a sharp, vibrant attack. The 5 toms are played with sticks and mallets, while the kick is provided in wood and felt beater versions. A bonus 'lite' Yamaha Jimmy Chamberlin signature snare is provided to complement the kits. This steel-shell snare is provided in 4 versions played with sticks and mallets, with the snare strainer on and off. Full-detail versions of this snare are available in the Yamaha Signature Snares vol.2 expansion pack. The recording sessions took place at Omega Studios in Maryland, USA, with identical recording conditions to those for other Yamaha-based downloadable expansions and the BFD Jazz & Funk, Percussion, B.O.M.B. and JEX libraries. BFD Heavy is also designed to sound great with BFD2's built-in sounds as well as with BFD-compatible libraries recorded in other locations. 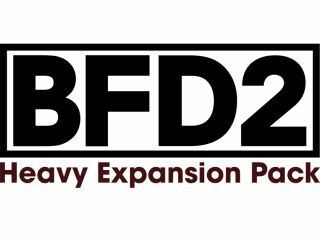 BFD Heavy Expansion Kit is a download-only product and is available now from the FXpansion web shop!